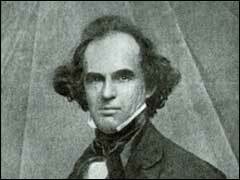 Nathaniel Hawthorne was born on July 4, 1804 in Salem, Massachusetts. He spent time in Maine as a youth and spent some time living in Boston, but much of his life until 1850 he spent in Salem. Moreover, the events of 1692 in Salem haunted him, especially as his great-grandfather was a judge in the witchcraft trials. It was in Salem, too, where Hawthorne met Sophia Peabody whom he married on July 9. 1842. The Hawthornes lived in Concord after they married, but they returned to Salem late in 1845, and in 1846 Hawthorne took the position of Surveyor of the Port at the Salem Custom House. After losing his job (original article from the Salem Register part 1, part 2) in June of 1849 because of a change in political administrations, and after his mother died not long after, Hawthorne announced his wish to leave Salem, which he called "that abominable city," saying that he now had no reason to remain. In May of 1850, the Hawthornes moved to Lenox, Massachusetts, in the Berkshires. It was while living here that Hawthorne met Melville on a picnic on Mt Graylock in the summer of 1850. Thereafter Hawthorne and his family lived in Boston and Concord, before leaving in March of 1853 for Liverpool, England where Hawthorne assumed the position of Consul, an appointment made by his friend and former Bowdoin classmate, President Franklin Pierce. Hawthorne's last home was at the Wayside in Concord. He was in failing health in his final years, but in May of 1864 he left Concord to meet Franklin Pierce in Boston where they took a train to NH. On May 18, 1864, they arrived at the Pemigewasset House in Plymouth, NH. ; that night Hawthorne died in his sleep. Thus after the Hawthornes left Salem in 1850, they never returned there to live. And yet, Salem continued to permeate Hawthorne's life, as it remained the setting for many of his literary works.